One of the most memorable experiences in a Flight Attendant’s career is the graduation ceremony at the Flight Attendant Academy – or as it is more commonly referred to – The Charm Farm. Graduation Day is a day full of pride and excitement. Guests are welcome to attend Graduation Day to show their special someone love and support. Those who have witnessed it will agree that the pinnacle of the ceremony is the moment the Flight Attendants receive their wings. It’s a special moment because it is the exact moment that a person becomes a Flight Attendant. Without wings, the uniform is just a blue polyester suit. But when you pin those wings on a graduate, a transformation takes place. Now suddenly that person in the suit is a highly trained professional – someone that can think fast, save lives, fight fires and evacuate an aircraft in less than a minute. And that person is a member of a family. A huge and growing family of Flight Attendants, instantly recognizable, as if those wings were a genetic family trait. Bobbi Arestegui wore her wings with pride! 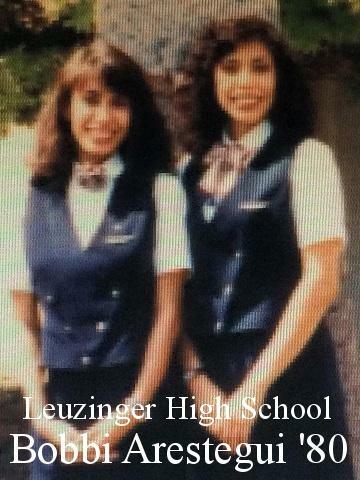 Bobbi Arestegui of Leuzinger High School's Class of 1980, on the left at AA Flight Attendant Training.